The flowers of Golden Lemon Crispum are typical of the crispum group. The lemon scented geraniums generally have nice white flowers with some purple veining. 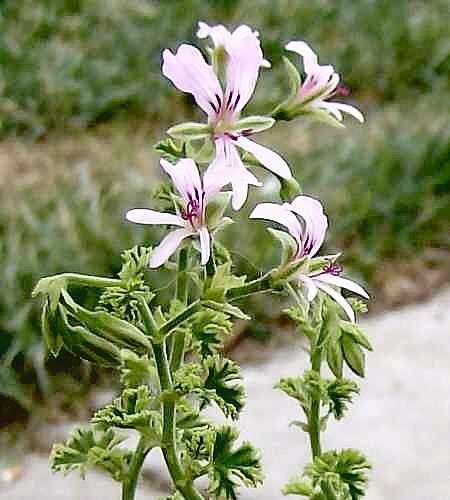 Often the three lower petals are long and narrow, giving the flowers a primitive wildflower look. Spring Park Lemon puts on a showy and long-lasting display. The leaves of the crispums are all small. This is a common trait of desert plants. All varieties of Pelargonium crispum that I have grown are tolerant of the heat although they appreciate some shade during the midsummer. Certainly they are worthwhile for gardeners in the desert Southwest.